UT student Sam Upton stands by the bulkhead entrance to the cellar of the Coan Hall house. The 2017 archaeological field school in historical archaeology took place at Coan Hall, located on a tributary to the Potomac River in Northumberland County, Virginia. The purpose of the multiyear project is to explore the headquarters of Chicacoan, the first permanent English colonial settlement on Virginia’s Northern Neck. Participants document and interpret 17th- and early 18th-century architecture, landscapes, and artifacts to trace cultural and environmental changes in the context of the wider Atlantic world. Directed by Barbara Heath, associate professor of anthropology, the field school brings together UT undergraduate and graduate students and volunteers from a variety of cultural and educational institutions, including Mary Washington University, The Thomas Jefferson Foundation at Monticello, the Fairfield Foundation, and the Archeological Society of Virginia. Descendants and local community members also lend a hand. 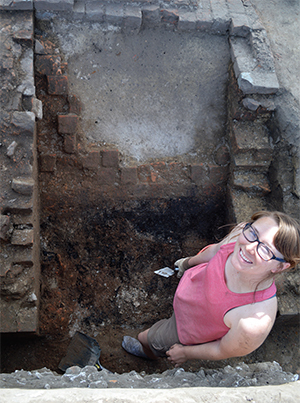 This year, archaeologists uncovered and documented structural elements of the Coan Hall house, circa 1640s, including exterior brick walls, structural post holes, the central H-shaped masonry chimney, a large brick- and stone-lined cellar, and a bulkhead entrance. They also traced a ditch from a fence or palisade line that predates the house and may be associated with an earlier structure that stood temporarily on the site before the manor house was constructed. Archaeologists documented the site with aerial photography, which provides precise data for planimetric mapping, and the use of photogrammetry – all funded by a student/faculty research award through the Graduate School. Brian Crane, who served as a consultant for the project, is creating a 3-D photogrammetric model of the site that will be featured on the forthcoming Coan Hall web page.